As software complexity increases, quality assurance (QA) and software testing teams will need to focus on increasing capacity and quality. Our guide provides a clear route map for improving testing and enhancing quality assurance across your organization. Key to the success of Internet of Things-enabled devices is ensuring safe and reliable connectivity, and adopting test automation tools to support the quality assurance processes of these products. In parallel, testing teams must embrace the benefits associated with the adoption of DevOps (real-time feedback & quick responses to bugs and change requests). Nowhere is the urgency felt more keenly than in industries where safety and reliability are critical issues in software development, such as in the healthcare, automotive and aviation industries. In these sectors, embedded software and connected mobile devices and services are gaining significant importance. 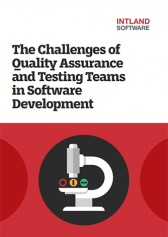 The challenges for QA and software testing teams include what to focus their efforts on, and how to add process predictability to their testing practices while overcoming the associated security and connectivity testing challenges. Download your free copy to see how codeBeamer’s advanced quality assurance and test management feature set enables efficient testing processes, and compliance with the most complex of industry standards.